Opens the Drawing Explorer dialog box; controls Layers, Layer States, Linetypes, Multiline Styles, Multileader Styles, Text Styles, Dimension Styles, Table Styles, Datalinks, Coordinate Systems, Views, Visual Styles, Lights, Materials, Render Presets, Blocks, External References, Images, PDF Underlays, Point Clouds, Dependencies, Page Setups, Section Planes, View Detail Styles, and View Section Styles. Press F1 to access help. Click X to close. Notes: The shortcut keystrokes shown below operate inside the Drawing Explorer dialog box. The options in menus and the buttons displayed by the toolbar vary depending on the current item. Shown below are the actions for layers. Creates a new item with a generic name, such as NewLayer 1 or NewStyle1. Use the Rename button to rename it. Some items cannot be erased, such as layer 0 and visual style 2D Wireframe. The source layer is removed from the drawing. Purges unused items from the drawing. 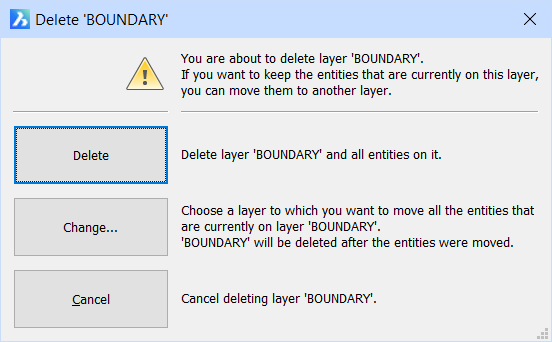 Some items cannot be erased, such as layer 0 and text style Standard. See Purge command. Copies the item to the Clipboard, and then deletes it from the drawing following the same procedure as the Delete button. Copies the item to the Clipboard for pasting elsewhere in the Drawing Explorer. Renames the selected item; alternatively, click on the item's name twice, slowly, to rename it. (Layers only) Removes overrides from the viewport properties of selected layers. Hides from view all layers that are not selected. Use the Invert Selection option to reverse which layers are visible. Makes the item current, such as making the selected layer the current (working) layer. When checked, displays the Drawings pane in the left of the Drawing Explorer dialog box, in which you can select other drawings and items. When checked, displays the Details pane in the center of the Drawing Explorer dialog box, in which you view all related items and possibly edit them. When checked, displays the Preview pane at bottom of the Drawing Explorer dialog box, in which the selected item can be viewed. When checked, displays the Edit pane in the right of the Drawing Explorer dialog box, in which the properties of items can be changed. Toggles the display of the status bar at the bottom of the Drawing Explorer dialog box. (Layers only.) When checked, displays the Filters pane for layers. Displays the details of items. Displays items as an array of icons; applies only to blocks and external references. Displays items in tree form; applies only to layer states, data links, dimension styles, external references, images, PDF underlays and dependencies. Updates the drawing display to reflect changes made in this dialog box. Toggles automatic updating of the display. 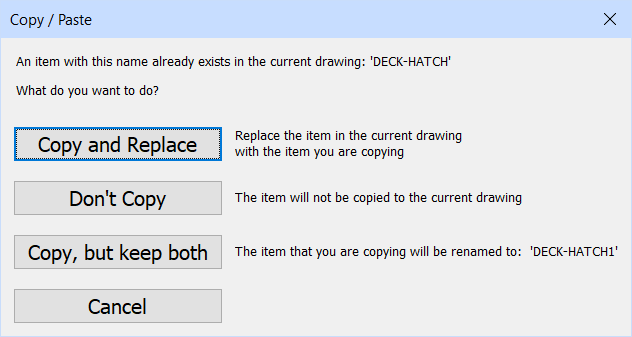 Restores the layout of the Drawing Explorer to the default layout for the selected category. 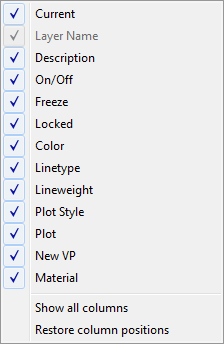 When you makes changes to the layout of the Drawing Explorer, the program remembers them. This option resets all your changes. (Applies to Blocks and External References only.) Specifies default settings for inserting blocks. See the ExpBlock command. Displays a list of drawings that are currently open. Click a drawing to see a detailed list of its content in the Details pane. Click the Add Local Folder button to add a folder, including all subfolders. Double click a drawing to open it. To copy items between drawings, drag definitions from one drawing to another; this lets you copy layers, text styles, linetypes, and so one to another drawing. 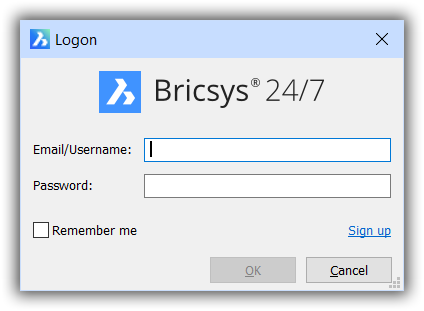 Click the Logon to Bricsys 24/7 button. Select a drawing in a project, and then right-click to download or view the drawing. Reports on the layers defined in the selected drawing. Click to explore the layers; see the Layer command. Reports on the layer states defined in the selected drawing. Click to explore the layer states; see the LayerState command. Reports on the linetypes loaded into the selected drawing. Click to explore the linetypes; see the Linetype command. Reports on the multiline styles defined in the selected drawing. Click to explore multiline styles; see the MlStyle command. Reports on the multileader styles defined in the selected drawing. Click to explore multileader styles; see the MLeaderStyle command. Reports on the text styles defined in the selected drawing. Click to explore text styles; see the Style command. Reports on the dimension styles defined in the selected drawing. Click to explore dimension styles; see the DimStyle command. Reports on the table styles defined in the selected drawing. Click to explore table styles; see the TableStyle command. Reports on the data in the drawing linked to external spreadsheet files. Click to explore data links; see the DataLink command. Reports on the named user coordinate systems (UCS) defined in the selected drawing. Click to explore coordinate systems; see the ExpUcs command. Reports on the named views in the selected drawing. Click to explore saved views; see the View command. Reports on the visual styles defined in the selected drawing. Click to explore visual styles; see the VisualStyles command. Reports on the lights placed in the selected drawing. Click to explore lights; see the LightList command. Reports on the materials defined in the selected drawing. Click to explore materials; see the Materials command. Reports on the render presets defined in the drawing. Click to explore render presets; see the RenderPresets command. Reports on blocks defined in the selected drawing. Click to explore blocks; see the ExpBlocks command. Reports on the external references (xrefs) attached to the selected drawing. Click to explore xrefs; see the Xref command. Reports on the images attached to the selected drawing. Click to explore the images; see the Image command. Reports on the PDF underlays attached to the selected drawing. Click to explore PDF underlays; see the Pdf command. Reports on the point clouds attached to the selected drawing. Click to explore point cloud; see the PointCloud command. Reports on the external files that the selected drawing depends on. Click to explore dependencies; see the eTransmit command. Reports on the page setups attached to the selected drawing. Click to explore page setups; see the PageSetup command. Reports on the section planes defined in the selected drawing. Click to explore the section planes; see the SectionPlaneSettings command. Reports on the view detail styles defined in the selected drawing. Click to explore the view detail styles; see the ViewDetailStyle command. Reports on the view section styles defined in the selected drawing. Click to explore the view section styles; see the ViewSectionStyle command. DimStyle - creates and modifies dimension styles, through the Drawing Explorer. eTransmit - creates a package of a drawing file and all its dependencies, such as: external references, images, font files, plot configuration files, plot style tables and font map files. ExpBlocks - opens the Blocks section of the Drawing Explorer dialog box. ExpFolders - opens the Drawing Explorer on the Folders tab. 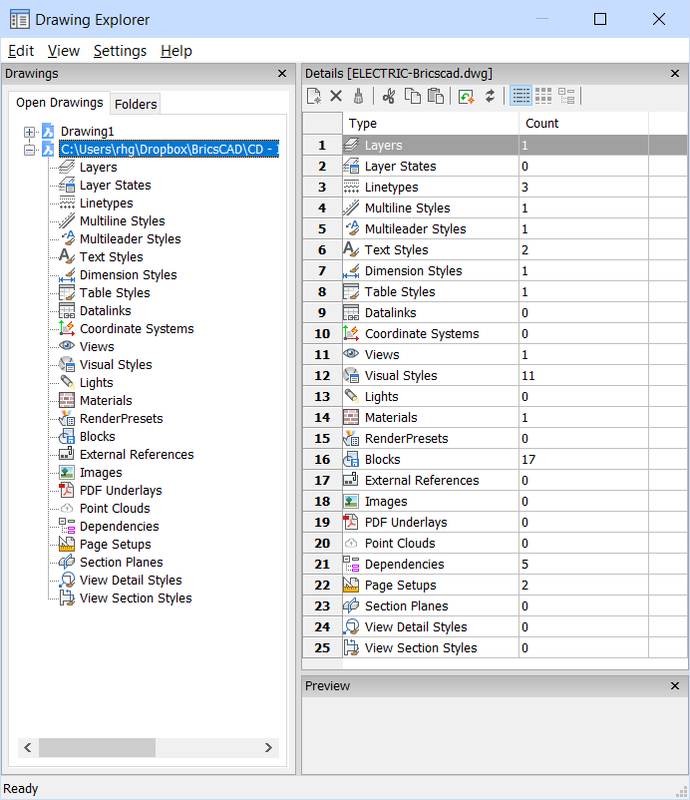 ExpUcs - creates, modifies, and deletes named UCSs through the Drawing Explorer. Image - inserts images in drawings through the Drawing Explorer. Linetype - Loads, sets, and creates linetypes through the Drawing Explorer. Layer - creates layers, changes their properties, and removes layers through the Drawing Explorer. LayerState - creates and controls layer states in the Drawing Explorer. LightList - displays the Drawing Explorer - Lights dialog window. Materials - creates materials and edits their properties through the Drawing Explorer. MlStyle - creates and edits multiline styles. PageSetup - creates and edits page setups for plotting drawings in the Drawing Explorer. Pdf - attaches PDF files to the current drawing through the Drawing Explorer. RenderPresets - allows to create and edit render presets, and to set the current render preset through a dialog box. SectionPlaneSettings - Defines the properties of a section plane entity in the Drawing Explorer - Section Planes dialog. SheetSet - Manages sheet sets. Style - creates and modifies text style with the Drawing Explorer. TableStyle - creates and edits table styles through the Drawing Explorer - Table Styles dialog box. View - creates and sets named views through the Drawing Explorer. VisualStyles - creates and controls visual style definitions in the Drawing Explorer. Xref - attaches DWG files to the current drawing through the Drawing Explorer.